Recently, Metallic and Pearlescent Colors, they are so-called Gonioapparent Color, are frequently used for the exterior color of the industrial products such as automobile or smart phone. These colors show change in appearance with change in illlumination angle or viewing angle, and make industrial products more refined attractive. Therefore new effective materials and painting methods are developed rapidly, and color expression level is getting higher and higher. Originally, Gonioapparent Color has more complicated optical properties than solid color. Accordingly, color management like color matching and color quality control is very difficult and sometimes depends on the experience and the perception of the experts. Therefore, it is now a pressing issue to establish a rational color management system. 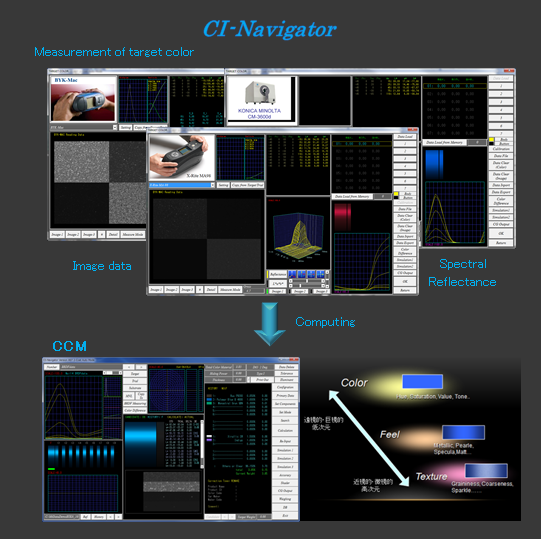 CI-Navigator is developed mainly for the purpose of CCM for Metallic and Pearlescent Color, and it is constitued of a multi-angle spectrophotometer, an imaging device and a computer. 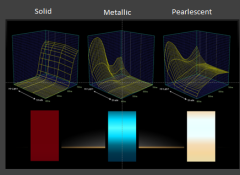 CI-Navigator calculates the precise fomula based on both spectral reflectance measured with multi-angle spectorophotometer and image data, therefore it can agree not only color but also sparkle and graininess with the target color's at a visibility level. Sparkle and graininess are so-called feel and texture. 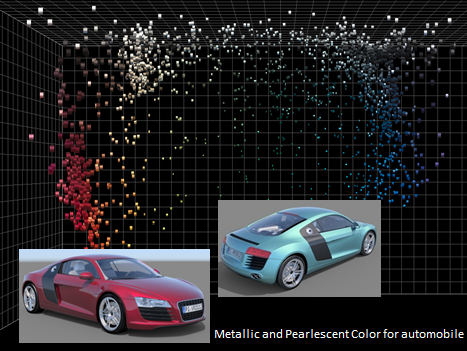 In an industry and an academic field, there is not the CCM system for Metalllic and Pearlescent Color having enough performance other than CI-Navigator throughout the world. CI-Navigator is introduced into various industries and academic fields, and repeats version up to meet the needs of the customers. copyright©2014 OFFICE COLOR SCIENCE CO., LTD. all rights reserved.